OSHA’s New HazCom/GHS Enforcement Directive – What You Need to Know! A newly released OSHA directive has given Safety and Health Officials additional guidance on enforcing the Hazard Communication Standard post GHS adoption. Although the document is written for inspectors, it’s packed with valuable information you’ll want to get up to speed on if your business deals with hazardous chemicals. 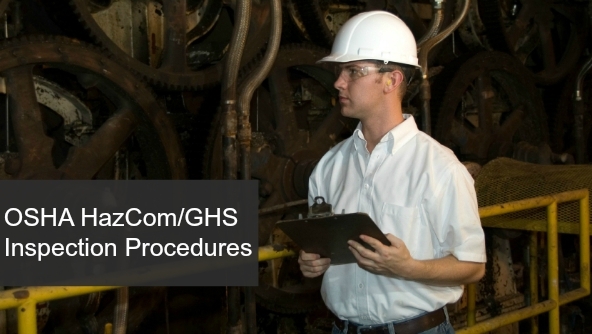 The July 9 directive, titled “Inspection Procedures for the Hazard Communication Standard (HCS 2012),” provides Certified Safety and Health Officials (CSHOs) with detailed policies and procedures to check for compliance with the Hazard Communication Standard (HazCom) 2012 while conducting inspections of manufacturers, distributors, and employers. If you’re up for a 124-page read, you can find the entire document here. Below, we’ve summarized some of the highlights in relation to key areas where steps need to be taken for HazCom/GHS compliance. It’s critical to make sure you have these bases covered before OSHA visits, or you could face citations and potentially hefty fines. You can also join us for one of our monthly GHS Webinars where we discuss breaking HazCom news. One noteworthy instruction in the directive related to hazard communication plans involves multi-employer worksites. In these situations, each employer with hazardous chemicals must include details in their plan of how they will provide the other employers with on-site access to SDSs. This doesn’t mean that one employer must physically give the other employers the SDSs, but they are required to inform the others of where the documents will be maintained. OSHA will be checking to make sure that each and every hazardous chemical found in a workplace (even if not in use) is documented in the inventory, which must include a product identifier aligning with an SDS and label for each chemical known to be present. CSHOs will be checking for whether a chemical’s product identifier can be cross-referenced with the inventory list, and will review a representative number of SDSs against the list. Because GHS reclassification can result in new hazardous chemicals, it’s important to make sure your inventory is updated accordingly. Following GHS Revision 3 vs. later versions: This is new information from the directive that’s important to note. OSHA instructs CSHOs to look for use of warning elements on labels and SDSs that are based on more recent versions of GHS than Revision 3 (the version HazCom 2012 follows), and that might conflict with Revision 3. For example, the UN’s Revision 4 of GHS introduces a new category for aerosols — Category 3 (nonflammable) — and in this new category aerosols do not require a pictogram and are exempt from classification as a gas under a pressure. No such category exists under HazCom 2012/GHS Revision 3. So, if an aerosol met the criteria for a gas under pressure, it would require all associated label elements — including the gas under pressure pictogram — to be OSHA HazCom 2012-compliant. Following GHS Revision 3 will ensure compliance. Shipping labels: CSHOs will look for updated GHS labels that include all required information, such as a product identifier, signal word, hazard statements, and precautionary statements (which must be written out — it is not sufficient to reference only the GHS precautionary statement number, e.g., P101, P230, P301, etc.). Manufacturers and suppliers were required to ship using updated labels after June 1, 2015, except in cases where classification information was not available from upstream suppliers and “reasonable diligence and good faith efforts” were made to obtain them (more on that below). OSHA has given distributors with existing stock packaged prior to June 1, 2015 — and labeled under the old HazCom rules — the ability to continue to ship this already packaged stock downstream without re-labeling it. They must, however, include an updated label and safety data sheet along with each container after December 1, 2015, or upon request. After December 1, 2017, all distributor containers must be GHS-compliant labeled prior to shipping. Workplace labels must either replicate all of the information on the manufacturer shipped label for a chemical or use a combination of information including a product identifier and words, pictures, symbols that fully communicate hazards. Whichever system is used, it must make all hazard information about a chemical immediately accessible to employees. All labels in the workplace must also be legible without the use of any aid (not counting glasses for employees who normally have to wear them) — otherwise, they won’t be considered compliant. Employers are required to train employees on hazardous chemicals in their work areas, including labeling requirements, SDS requirements, and measures for protection from hazards. Training is required at the time an employee is assigned to work with any hazardous chemical and whenever a new hazard is introduced. During inspections, safety officials will evaluate training programs by reviewing all of their components and conducting interviews with employees to gauge whether they are properly trained. Because GHS changes affect areas of training, updates to various parts of your training program, including the written plan, are necessary to stay in compliance. Employers had the deadline of December 1, 2013 to make sure employees were trained on GHS label elements and SDS format. GHS requires a prescribed, strictly-ordered 16-section format for SDSs. Manufacturers were to begin using and providing SDSs updated in this format on June 1, 2015 when sending initial shipments, making the next shipment after an SDS has been updated, or upon request by downstream users. Inspectors will be checking for whether all SDSs follow this new format — and in cases where manufacturers have not yet complied as a result of needing more information from upstream, asking for evidence of efforts to obtain it. Employers and distributors are also responsible for ensuring they have updated SDSs — when they haven’t received them, they are expected to make attempts to request them from upstream. Named Party: The named party on an SDS must be the same as the named party on the label. If there is a different company name on the SDS than on the label, the company that changed the name is responsible for both. Timing of Orders and SDS Compliance: If an employer has ordered a chemical after the manufacturer has updated the associated SDS, the employer is required to maintain the most current version of the SDS or will be considered out of compliance. However, if an employer ordered the chemical prior to June 1, 2015 and is maintaining the latest HCS 1994 (pre-HazCom 2012) SDS as of the last shipment received of the product, they are in compliance. OSHA will evaluate all of these factors, but may consider any combination of them acceptable. So, if you have a convincing reason for being behind schedule, make sure it’s fully documented and that you have a path toward compliance outlined. As for employers, they are also expected to make an effort to obtain SDSs from upstream suppliers if they are not received at the time of the first shipment. However, OSHA says that if these requests to manufacturers and distributors prove unsuccessful in obtaining updated SDSs, employers should contact an Area Office for assistance. With the release of these new GHS enforcement guidelines and another deadline coming up quickly on December 1, 2015, it’s as important as ever to keep HazCom 2012 compliance a top priority. Citations for violations will only become more and more frequent, so when OSHA comes knocking, you’ll be glad you took the necessary steps to comply. Remember, help is available. Electronic solutions can help you manage your SDSs, labels, employee training, chemical inventory and more. Reach out to an MSDSonline compliance expert to learn more about GHS and how our solutions can help with the transition. EH&S Blog Compliance Education OSHA’s New HazCom/GHS Enforcement Directive – What You Need to Know!